by marc / Thursday, 28 March 2019 / Blog Category: Everything Vegas. Celebrations in Las Vegas are a bit more extravagant than most cities. Caesars Entertainment celebrated Paris Las Vegas’ 20th anniversary in style. 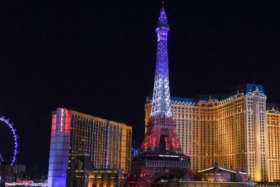 They illuminated the Las Vegas Strip with the debut of a $1.7 million light show at the Eiffel Tower on Wednesday, February 27. Caesars Entertainment is investing more than $92 million in Paris Las Vegas this year. As Paris Las Vegas celebrates its platinum anniversary, the casino-resort will offer an additional 1,600 renovated guest rooms and the all-new Voie Spa & Salon in addition to the beautiful light show. The new light show is inspired by the original Eiffel Tower’s illuminations in France. The enhanced light show at the Paris Las Vegas has approximately 300 color washing light fixtures and more than 800 white strobe lights on the tower’s exterior. The attraction will offer a free, recurring show every night. The show features synchronized and choreographed twinkling and colored lights for visitors to enjoy nightly on The Las Vegas Strip. The light show will take place every 30 minutes on the hour and half hour from sunset to midnight daily. Paris Las Vegas hotel room renovations started in 2016. Nearly 1,300 hotel rooms were updated in two phases. Paris Las Vegas plans to complete the final phase of nearly 1,600 new guest rooms and suites in May. Designed by KNA Designs, all 2,900 renovated guest rooms and suites at Paris Las Vegas will combine classic European elegance with modern flair. spacious shower with a glass enclosure with a rain shower head with a hand-held wand. You can see the new Burgundy Rooms here. The all-new Voie Spa & Salon is a new $3.75 million 25,000-square-foot facility that was inspired by sensory journeys throughout regions of France. The environment of the new spa sounds lovely. Voie Spa & Salon offers a wide range of treatments that include specialized bathing experiences to detoxify the body, signature sound therapy massages and hydra-cleansing treatments tailored to individual needs. In the salon, guests can enjoy specialty plant-infused hair rituals, as well as manicure and pedicure treatments. You can find more information about the new Voie Spa & Salon here. Marc Meltzer covers Las Vegas, gaming and men’s lifestyle for various outlets. Check out his blog at Edge Vegas.